Can a Level 2 or (3) organization be considered ISO compliant? Should SPI be based on CMM or ISO? Download "Can a Level 2 or (3) organization be considered ISO compliant? Should SPI be based on CMM or ISO?" 1 CMM and ISO The ISO 9000 standards developed by the International Standards Organization are both concerned with quality and process management. 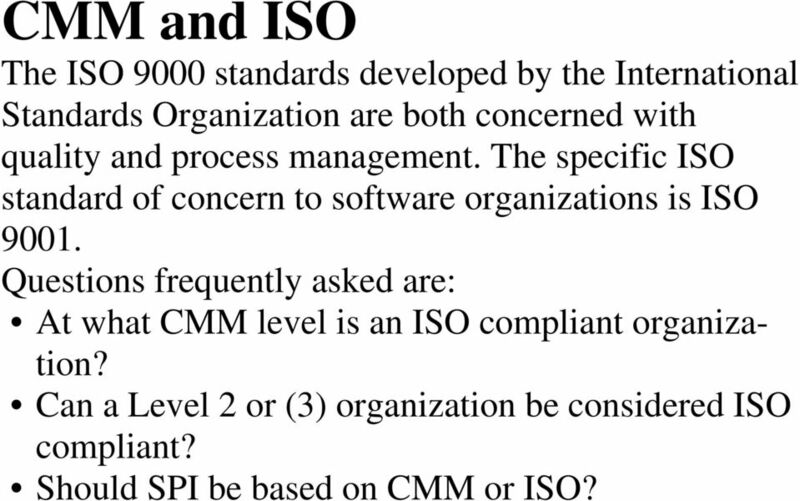 The specific ISO standard of concern to software organizations is ISO Questions frequently asked are: At what CMM level is an ISO compliant organization? Can a Level 2 or (3) organization be considered ISO compliant? Should SPI be based on CMM or ISO? 2 ISO Series - 1 The ISO series of standards is a set of documents dealing with quality systems that can be used for external quality assurance purposes. They specify quality system requirements for use where a contract between two parties requires the demonstration of the supplier s capability to design and supply a product. The two parties could be an external client and a supplier, or they could both be internal. 3 ISO Series - 2 ISO 9000 is a guideline that clarifies the distinctions and interrelationships between quality concepts and provides guidelines for the selection and use of a series of international standards on quality systems that can be used for internal quality management purposes (ISO 9004) and for external quality purposes (ISO 9001, 9002, and 9003). 5 Software and ISO 9001 ISO 9001, Quality systems-model for quality assurance in desig.development, production, installation, and servicing, is the ISO standard that applies to software development and maintenance. 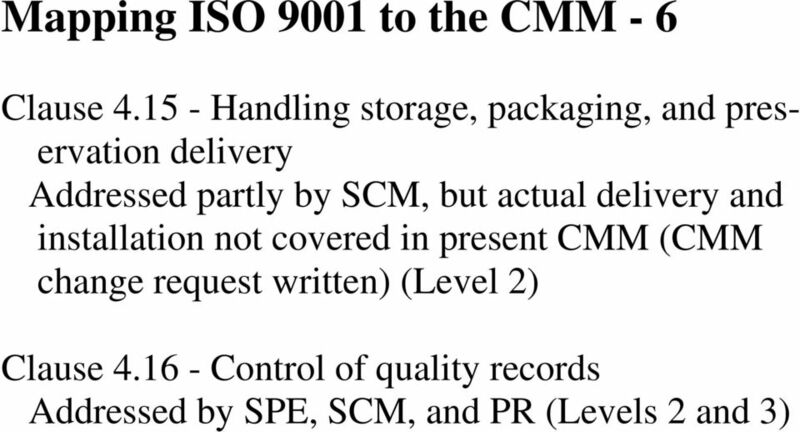 There is a guideline, ISO , for applying ISO 9001 to software processes. 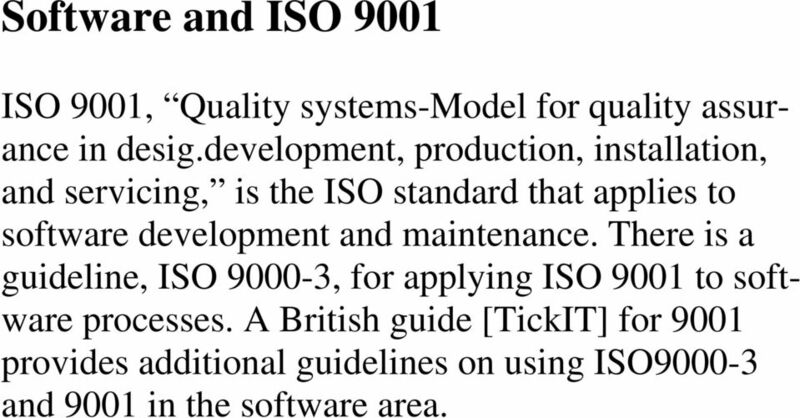 A British guide [TickIT] for 9001 provides additional guidelines on using ISO and 9001 in the software area. 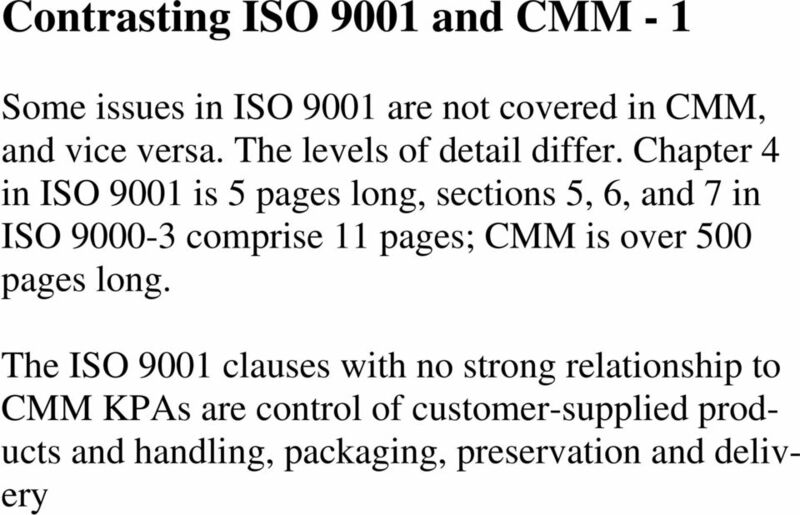 15 Contrasting ISO 9001 and CMM - 2 The clause in ISO 9001 that is addresses in CMM in a completely distributed fashion is servicing. There is significant debate about the exact relationships to CMM for corrective and preventive action and statistical techniques. The biggest difference is the emphasis in CMM on continuous process improvement. 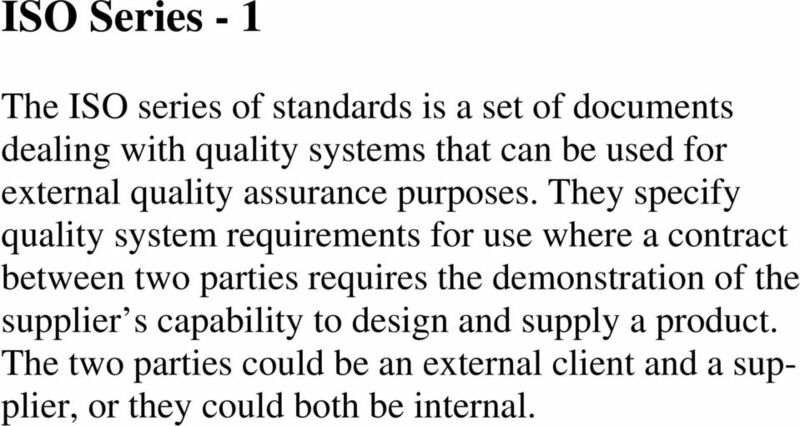 ISO only addresses minimum criteria for an acceptable quality system. 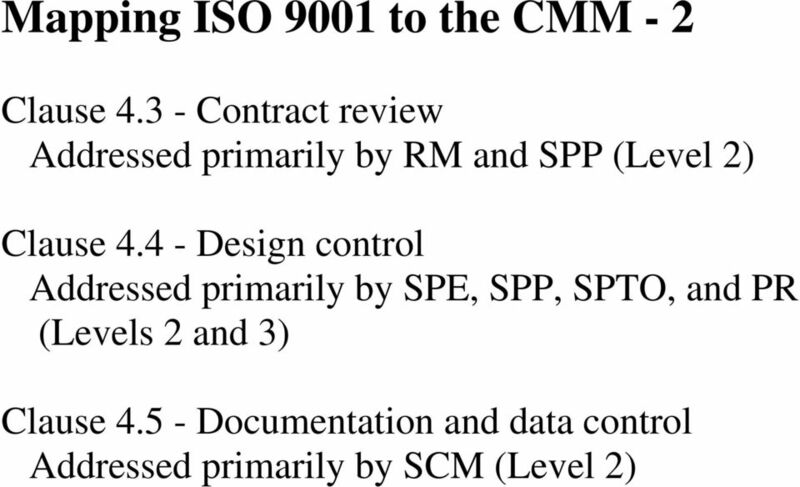 16 Contrasting ISO 9001 and CMM - 3 CMM focuses strictly on software, while ISO 9001 has includes hardware, software, processed materials, and services. 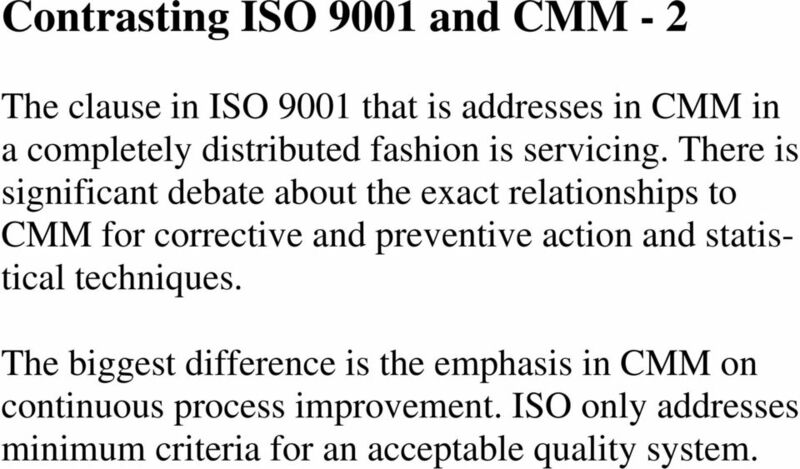 For both CMM and ISO 9001, the bottom line is Say what you do; do what you say. 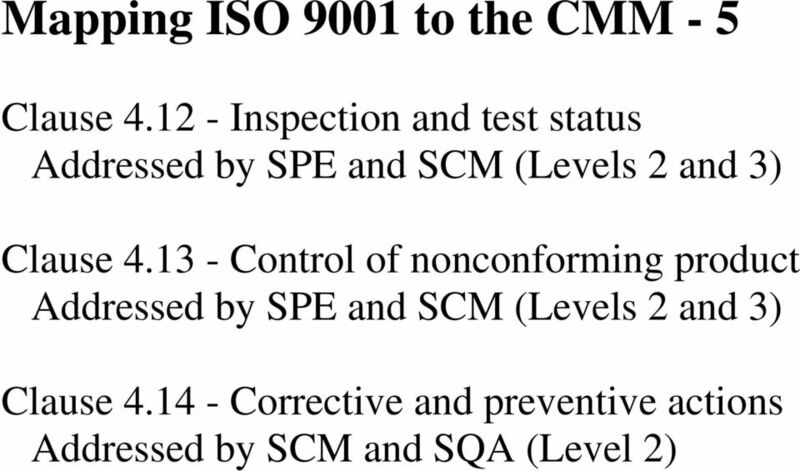 17 Contrasting ISO 9001 and CMM - 4 Every Level 2 KPA is strongly related to ISO 9001 Every KPA is at least weakly related to ISO 9001 A CMM Level-1 organization can be ISO 9001 certified; that organization would have significant Level-2 process strengths and noticeable Level-3 strengths. 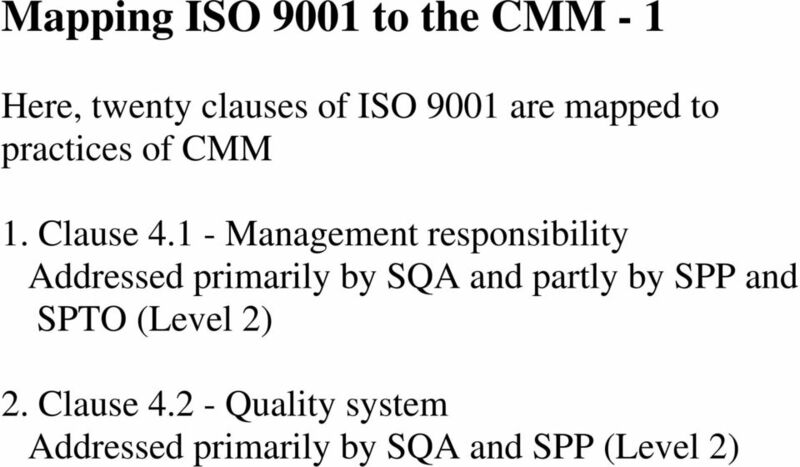 18 Contrasting ISO 9001 and CMM - 5 Given a reasonable implementation of the software process, a ISO 9001 certified organization should be at least close to CMM Level-2. 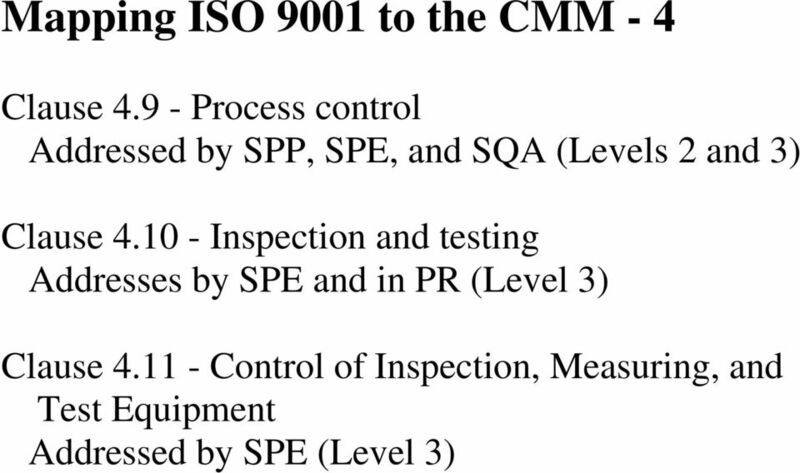 Can a CMM Level-3 organization be considered ISO 9001 compliant? 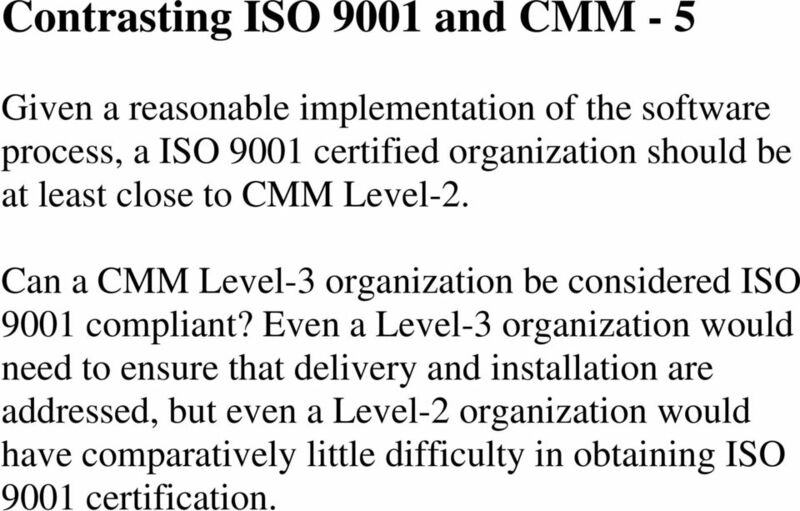 Even a Level-3 organization would need to ensure that delivery and installation are addressed, but even a Level-2 organization would have comparatively little difficulty in obtaining ISO 9001 certification. 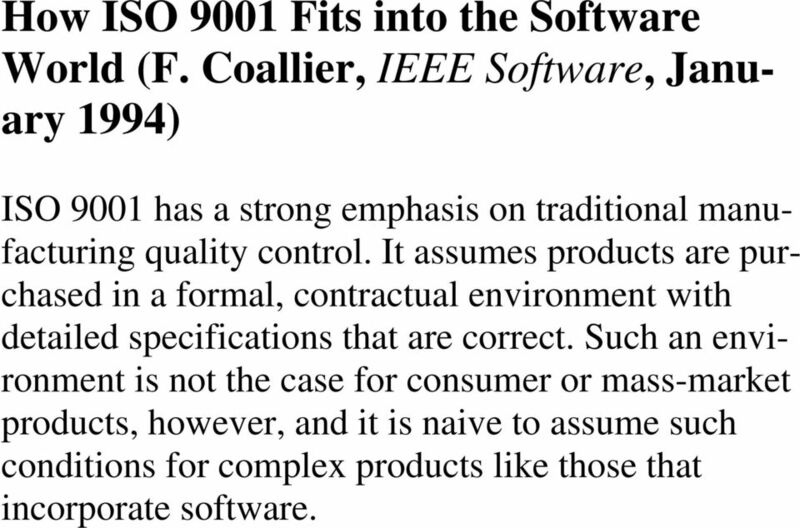 19 How ISO 9001 Fits into the Software World (F. Coallier, IEEE Software, January 1994) ISO 9001 has a strong emphasis on traditional manufacturing quality control. 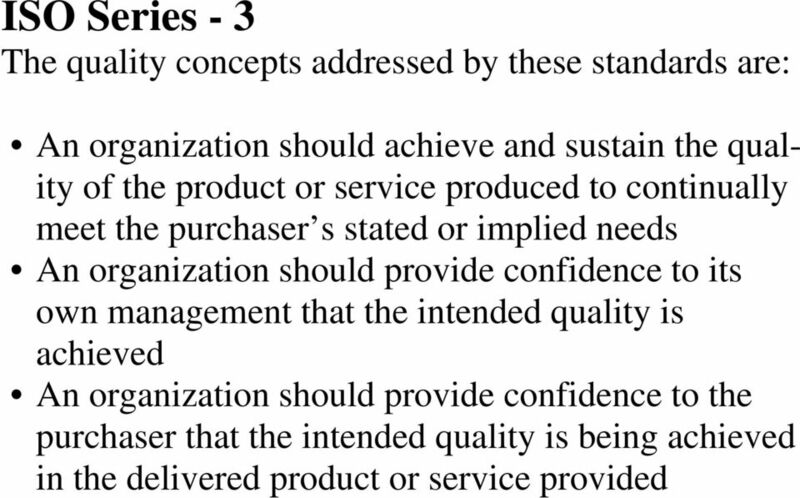 It assumes products are purchased in a formal, contractual environment with detailed specifications that are correct. Such an environment is not the case for consumer or mass-market products, however, and it is naive to assume such conditions for complex products like those that incorporate software. 20 CMM/ISO Software products are inherently complex and challenging to scope, develop, implement, verify, validate, and maintain. This requires a total-quality approach focused on customer satisfaction and continuous improvement. 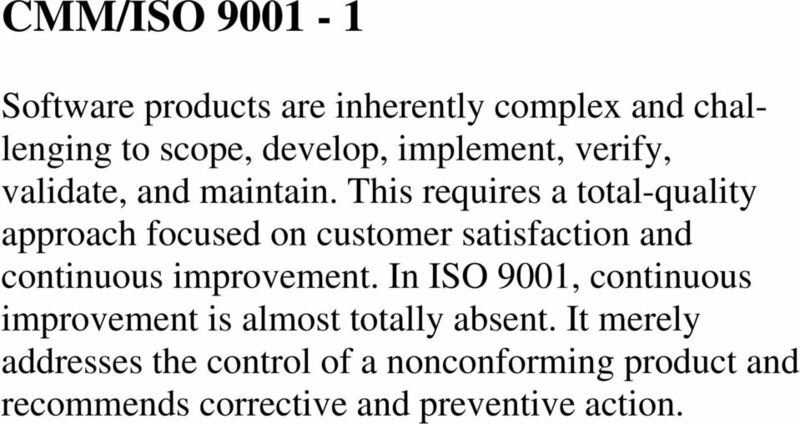 In ISO 9001, continuous improvement is almost totally absent. It merely addresses the control of a nonconforming product and recommends corrective and preventive action. 21 CMM/ISO For an organization that develops and manufactures embedded software products, an ISO 9001 certification tells very little about its software development capability. Certification means only that some basic practices are in place. CMM is a more comprehensive model to measure software development capability. It covers more processes and has a five-level rating system that emphasizes continuous improvement. 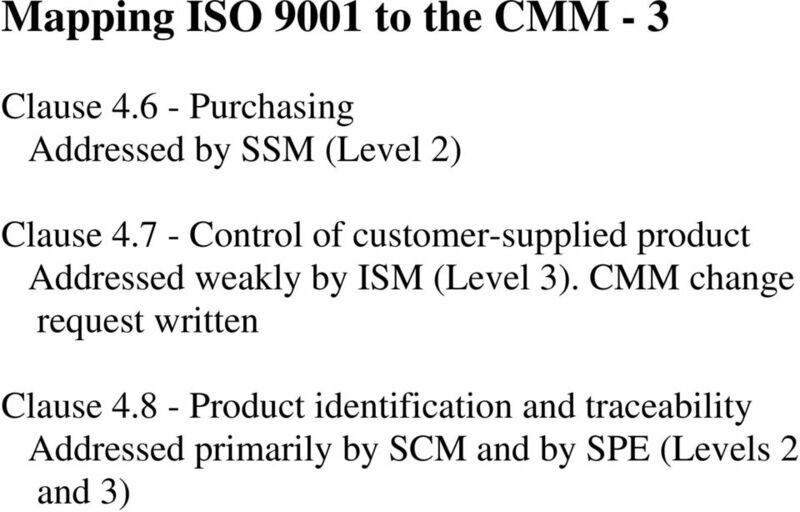 22 CMM/ISO With ISO 9001, once you are certified, your challenge is only to maintain certification. CMM can be used as a self-assessment. ISO 9001 certification requires auditors, which places emphasis on opinions of outsiders whose abilities may be unknown or marginal. ISO certification is usually prompted because certification is needed to get contracts. CMM review is usually done to improve and involves a more detailed study than does an ISO review. 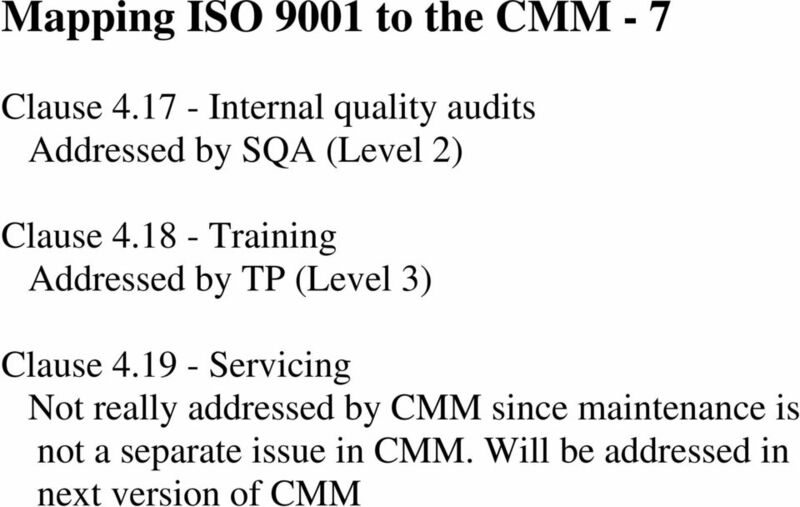 23 CMM/ISO ISO 9001 can still be worthwhile if: The auditors are good If the organization is CMM Level 1 or 2 because ISO 9001 covers the basics and can help the organization grow. ISO 9000-3 OR CMM: WHICH IS MORE EXTENSIVE FOR THE QUALITY SYSTEMS IN A SOFTWARE INDUSTRY? a) To achieve an effective Quality Assurance System complying with International Standard ISO9001 (Quality Systems). Quality Manual. This Quality Manual complies with the Requirements of ISO 9001:2008 and ISO/IEC 80079-34, Explosive Atmospheres - Edition 1. Correlation matrices between 9100:2009 and 9100:2016 This document gives correlation matrices from 9100:2009 to 9100:2016. This document can be used to highlight where the new and revised clauses are located. Document Control. White Paper By Galaxy Consulting. At Your Service Today Tomorrow We Appreciate The Privilege Of Serving You! Abstract.